Our new 3 gram foil packs of all-organic, sustainably produced 50x Nelumbo nucifera (Blue Lotus) extracts are unlike anything else we've ever offered. After countlessexperiments, we crafted powerful single plant, full spectrum resins aswell as extremely potent blends of some of the most famous entheogensavailable today. Our 50x Full Spectrum extracts are a proud offeringof our shop and have already become Top Sellers here in the short timethey've been available. 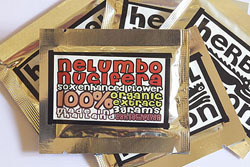 Nelumbo nucifera (Blue Lotus) has been gaining immense popularity,which indeed speaks volumes about it's effectiveness. This Full Spectrum Blue Lotus 50x resin has an invigorating scent second only to the Nelumbo/Nymphaea extract we offer. Some prefer the individual plants; hence this finely-crafted offering, which of course, is covered by our 100% Satisfaction Guarantee.